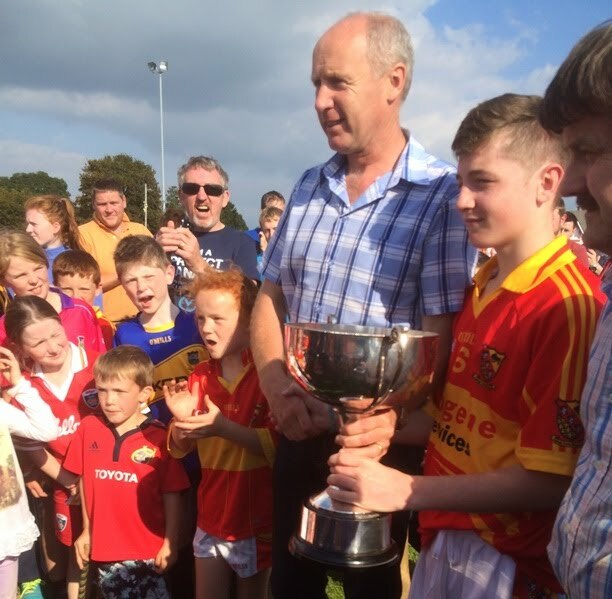 In the A Final,.Moycarkey Borris were up against West champions Cappawhite. .Within the opening minute Fraser Allen pointed a free to put the West side on the score board. Three minutes later the next addition to the score sheet came from Moycarkey as Jack Fallon who slotted over a 65 to put the sides level and it was indeed to prove to the only time that the margin would be minimal. On the fifth minute Eamon Martin had the Mid followers in delight with a cracking goal. From the resulting puck out goal number two for Moycarkey was delivered by Darren Flood. Things were looking bleak for Cappawhite as Moycarkey appeared to have upped many gears..Both sides had missed opportunities regarding points. On the ninth minute Cappawhite marksman Fraser Allen pointed his third. Second later Cappawhite were reeling when their net was rattled for a third Moycarkey goal from Bill Maher. However two minutes later Jack Redican had the Cappa supporters on their feet with the Moycarkey net shaking to put the score at Moycarkey 3-1 Cappawhite 1-3. Their joy was to be short lived as on the sixteenth minute Kyle Shelly clocked up a fourth Moycarkey goal. The mid champions were in devastating mode and during the closing five minutes they added another four points to their tally. Jack Fallon from a 65 and three from play courtesy of the ever roaming John Kirwan to put the interval score reading Moycarkey Borris 4-5 Cappawhite 1-3. Rhys Shelly the Moycarkey keeper had hawk eye vision grabbing some high incoming balls clearing his lines with ease. Tom Ryan was always on top in his area surrounding the square. From the back line out Moycarkey were very well in control.. While for Cappawhite they were constantly under siege and were never afforded much time on the ball. Upon the resumption Cappawhite were first to record a score with a point from Brendan Murphy on the second minute. Three minutes later another Cappawhite addition with a point from Gearoid Ryan The Moycarkey outfit were in commanding mode right throughout all areas of the pitch leaving it very difficult for the Cappawhite boys to penetrate .Such supremacy meant that the Moycarkey attack enjoyed a lot of possession and with it came goal number five on the sixth minute from Darren Flood and his second in all to put the score at 5-5 to 1-5. Even though it was only four scores that separated the sides, the decisive factor was the scores being goals. Despite the huge deficit Cappawhite found themselves in they never gave up contesting vigorously throughout the game. Over the next four minutes both sides added a point to their lot. On the nineteenth minute Fraser Allen got a goal for Cappawhite to put the score at 5-7 to 2-7. This was to be the last addition to the score record for the West champions and in contrast Moycarkey added another four points courtesy of a James Dillon free, Jack Fallon, Kyle Shelly and Darren Flood for a concluding score line of Moycarkey Borris 5-11 Cappawhite 2-7. Despite the score reading Cappawhite have to be commended for a very steadfast performance throughout the the entire contest. 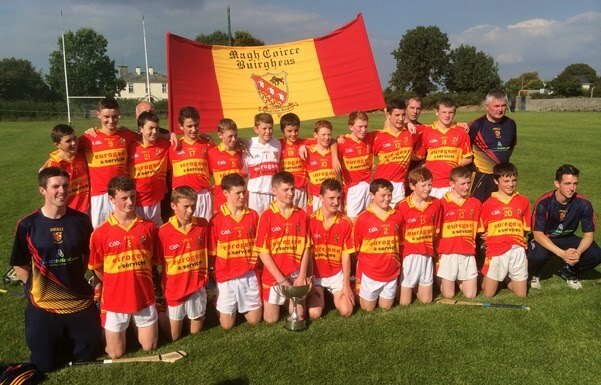 Moycarkey Borris were very worthy champions..They bridged a thirty year wait in securing this title. But to add much more to winning this title was the fact that the cup being presented was in memory of the late John Flanagan who passed to his eternal reward in 1994. John was a brilliant hurler for both Tipperary and his beloved Moycarkey Borris club. So it was a very delighted captain Rory Darmody who was lifting the Memorial John Flanagan cup for Moycarkey for the first time .Prior to the presentation chairman Joe Kennedy thanked both teams for a good game of hurling. He acknowledged referee John O’Grady and his officials for a job well done. He thanked all involved in the Boherlahan Dualla club for having everything in order..